As summertime heats up here in the Mile High City, more and more people are signing on the dotted line and receiving the keys to their new homes. Regardless of where you’re moving or what kind of property you’re moving into, it’s important to secure quality moving services to help your family relocate. Companies needing to upsize or relocate to a better spot can benefit from working with a local moving company as well. Abe Lincoln Movers is here to deliver personalized service to meet your goals and complete your move as efficiently as possible to get your life back on track without stress or uncertainty. Our professional movers can handle every stage of the process, assisting you with packing, and transporting your valuables in our fleet of maintained trucks. This last part may prove very attractive for homeowners dreading the drive in a rented moving truck. 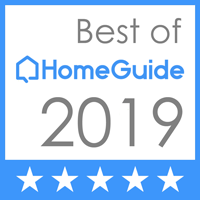 We’re proud to be your trusted experts for residential moving across Denver and the Front Range, delivering peace of mind for clients with estates of all sizes. If you are planning on driving the truck yourself, it’s essential to drive safely. 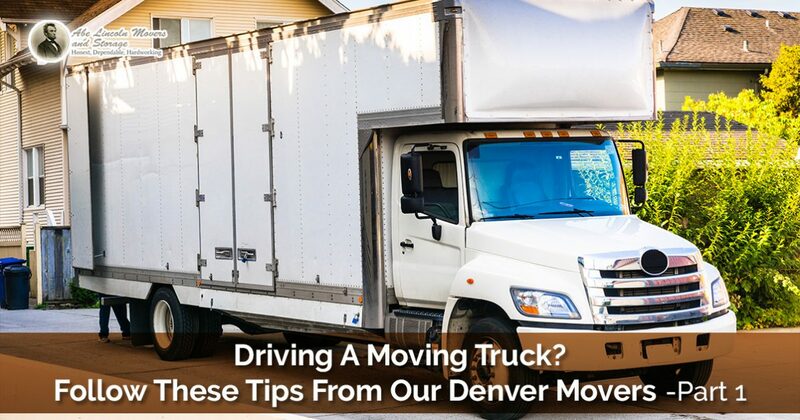 We’ll cover a few driving tips for using a moving truck for Colorado drivers. If you’re looking for professional movers to help every step of the way with quality services, be sure to call us for more info! Before putting your moving truck into “drive”, be sure to catch up on the handling differences between this large box and your personal vehicle. One key difference that we’ll refer to throughout this blog post is weight, as your 26-foot vehicle likely weighs more than 12,500 pounds! Once loaded up, expect that number to climb quickly. Heavier vehicles take longer to stop, making it important to give other drivers enough spacing. A lot of drivers are instructed to give cars in traffic an additional second of spacing for every 10 feet of the length of their vehicle. Residential moving experts are well-versed in the risks associated with heavy vehicles, including delayed stopping times. If you’re in doubt, be sure to check with our truck rental company for help! Larger, heavier loads make maneuvering through traffic a challenge as well. Most Coloradans know to allow plenty of space for braking, but some are not aware as to the demands when turning. Drivers that do not allow a wider berth for their longer vehicle may find themselves in a hazardous situation! Taking turns too fast can lead to a rollover, especially in combination with high winds. Not taking wide turns will also compromise the corner you are turning at, striking other vehicles, contacting poles or structures, and so on. You don’t want to be that guy stuck in the roundabout on Crossroads Boulevard with a wrecked vehicle! Another tip that may prove helpful is to remember to accelerate smoothly at lights. Many drivers do not want to hold up traffic and will attempt to floor it to get moving. Unless perfectly secure, your property in the back of your truck will likely shift and settle if you take off too fast. This can result in damages to both your valuables and the rental truck. Motorists that skipped the insurance coverage may be unhappy after gassing it down Alameda! Beyond the weight and length of your truck, the final dimension to keep track of is how tall your vehicle is. This element is one of the most common problems we see, and failing to account for your truck’s height can prove to be very dangerous and costly! Our government sets the minimum overhead structure height to 14 feet of clearance for city areas and 16 feet for rural areas. Bridges and overpasses are prevalent all across Denver, with I-25, US 36, I-70, and I-76 creating a major hub for drivers from all over. If you have rented a truck for your move, the chances are high that your vehicle will be legal on main roadways across the country. Keep in mind, though, that fast food drive-throughs are a different story! Instead of risking damages during your lunch break, we recommend parking the vehicle out in the lot! Driving a large rental truck can be a challenge, especially if you are lacking in experience. Next time, we’ll conclude this discussion with a few more helpful tips to help you navigate Denver traffic safely and effectively. Instead of worrying about this trek, you can rest easy knowing that experienced local movers will be here to help. Abe Lincoln Movers is proud to be your trusted team for commercial and residential moving in Denver and beyond for years. Our staff is friendly, professional, and courteous. We work hard to be among the best moving companies in Colorado, and our services are tailored to meet your high expectations. Contact us to learn more or reserve your moving services!